Sacred Ground tells the story how Quenten Agius and his nephew Chris discover human skeletal remains in the middle of a multi-million dollar housing development - is it a murder or is it an ancestor? Sacred Ground captures the inside story of Quenten Agius, a direct descendent of the traditional owners of Yorke Peninsula in South Australia, and his family fighting to save what is left of their ancient heritage and culture. 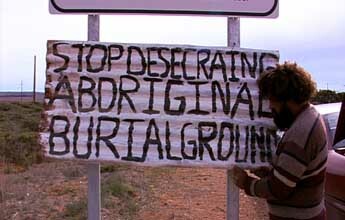 This film is a microcosm of what is happening to Aboriginal people all over Australia. Thousands of years of ancient heritage, culture and traditions are being swept away each year by ignorant or uninformed development processes. Quenten and his family are witnessing the desecration and destruction of the last remaining heritage and cultural sites on their traditional lands, sites that are vital to their Dreaming stories and cultural beliefs, stories and beliefs that have been handed down from generation to generation for thousands of years. Sacred Ground is a contemporary story – challenging, enriching and emotional – that takes us into an Aboriginal world that is rarely seen or heard. Quenten Agius puts up a protest sign. Quenten's family estimate that only five per cent of the cultural sites of the Adjahdura people remain intact. 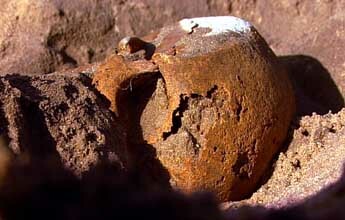 Aboriginal remains discovered by Quenten and his nephew Chris at Black Point. "I looked at [my] nephew and said, 'Nephew, that's a rock.' Black people can sense things and can feel things. He said, 'No, Uncle, that's a scull.'" The movie's website is www.sacredground.com.au.